We are a small cattery located near Edmonton, Alberta. 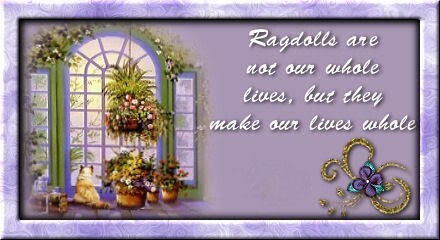 Rainbow Ragdolls is registered with TICA and is a member of the RFCI, RI and RFW. Our CFA and ACFA cattery name is Rainbowdolls. I have participated in the CFA mentoring program. I am the former treasurer of the Edmonton Cat Fanciers Club. Current treasurer of the Heartland Cat Fanciers Club in Edmonton. I had fallen in love with the Ragdoll breed at 14 years old, and in 1999 began my dream of breeding and raising Ragdolls. I started out breeding the traditional colors of seal and blue and have worked with torties and reds on occasion. We do not breed minks or solids and consider these colors very undesirable (there is a reason they are not allowed to be shown!). I have had many requests for a pure white ragdoll, while some do exist I would not recommend them as they can be deaf. Our goal is to raise healthy, happy, well-socialized kittens. We spend a lot of time every day with our kittens. They are using a scratching post already at a fairly young age. Pictures are taken every week or two. All kittens are raised around children. We believe it is important to attend and participate in shows to ensure we are breeding to proper type and tempermant. Our cats have been shown in ACFA, CFA, CCA and TICA in Canada and the US. We do try to show all our cats before breeding them. Unfortunately shows in Alberta are becoming extinct and showing for me just may no longer be possible as it is hard to travel with young children. All kittens go home with a health guarantee, veterinarian check-up, first two sets of vaccinations, dewormed, and will come with a starter kit containing pictures of the kitten, toys, and food. 6 weeks of Pet Plan health insurance is optional. All kittens are registered with TICA (beware of kittens being advertised as purebred but being sold without papers, it barely costs anything to get the papers, and it is the only way of knowing your kitten is a purebred Ragdoll. Also TCA is not a reputable registry). Buyer must agree to never declaw their kitten and never allow it to roam outside. We prefer to sell our kittens to people who are within driving distance of us so that we can personally meet the new owner and make sure the kitten will be a good match. Shipping can be arranged, buyer is responsible for all shipping costs (Example: cost of the crate, rabies shot if required, vet visit for travel health certificate, etc.) There are travel restrictions with some flights during the winter and also if very hot in the summer. If people are driving from far away I will meet them within a 1 hour radius to save them some driving time. After 1 hour it will cost $20 per hour of driving time to help cover the cost of fuel.